This Amazing dish is Old Milk Glass Blue, Pink, and Yellow Flowers. 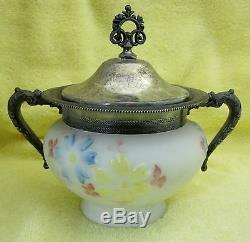 Nice Silver Plate handles, rim , and top. Silver Plate is in good Condition 6 tall from bottom to top of the lid. Now we have not polished it and are unsure how polished it will get... The style is that of Cosmos but we are not sure it is or if it just blends well with it. It has old wear mostly to the metal but it is solid and has no chips cracks or flaking. The item "Victorian Cosmos Style Milk Glass Sweet Meats Dish with Silver Plate Handle" is in sale since Sunday, August 5, 2018. This item is in the category "Pottery & Glass\Glass\Glassware\EAPG Pattern Glass 1850-1910\Colored". The seller is "thebutlerdidit" and is located in Portland, Oregon. This item can be shipped worldwide.